Blank grids are used for rough work. They can also be handy for taking notes or as scrap paper to help you solve the extrememly hard puzzles. Has completing sudoku puzzles become too easy? Too boring? Maybe you could try making up your own sudoku puzzles with these grids. No numbers on this large-print sudoku grid. The big boxes have plenty of room for writing. 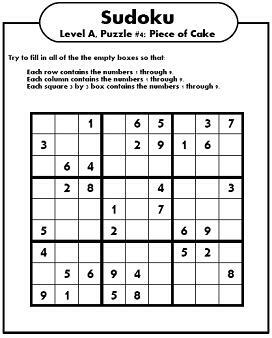 Includes basic sudoku instructions at the top. Same blank grid as above, but without the instructions printed on the top. This one has small black squares with bright blue outlining the larger 3 x 3 boxes. This blank puzzle has thicker, bolder lines than the others. Set of four smaller sudoku grids with blank boxes for you to fill in. A set of six puzzle grids fit neatly onto one sheet of paper.